Drought-tolerant once established, this woody vine can be used to cover a fence or as a ground cover. It blooms best in full sun, attracting butterflies and hummingbirds. 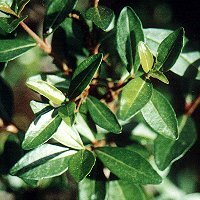 This shrub grows statewide in dry and moist sites and is drought-tolerant once established. It provides shelter and berries for wildlife. 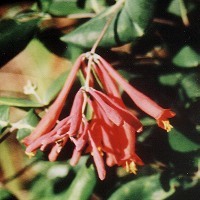 Plants of the honeysuckle family, Caprifoliaceae, are very valuable to wildlife. They attract butterflies and provide food, shelter, and nesting sites for birds and other wildlife.